Nobel Laureate's funeral Mass in Dublin followed by burial in Bellaghy cemetery in Derry. Fr Francis Bradley, Diocesan Administrator of the Diocese of Derry, drew from Seamus Heaney’s evocative words on the day Ireland’s foremost poet was laid to rest in Bellaghy cemetery in Derry. In a statement, Fr Bradley offered condolences to the poet’s wife, Marie, to his children Catherine Anne, Christopher and Michael, and to his entire family and many friends on behalf of the priests and people of the Diocese of Derry. The funeral Mass for the Nobel Laureate took place on Monday (2nd September) at the Church of the Sacred Heart, Donnybrook, in Dublin. The chief celebrant was family friend, Monsignor Brendan Devlin, who spoke in his homily about the beatitudes. “It cannot but strike us how many of them apply readily to our memories of Seamus Heaney,” Mgr Devlin said. 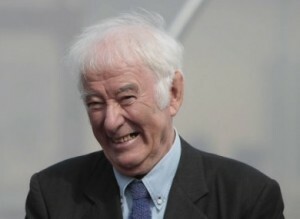 Derry priest, Mgr Devlin, who is also professor emeritus of modern languages at St Patrick’s College Maynooth, said that he and Seamus Heaney as young people attended devotions on May evenings and recited the litany. “Like many of our generation, we had both inherited, he on the plains of south Derry, I in the hills of Tyrone, the imagination and with it the memory of a community. What was important was not so much the prayers we did or did not say, as the prayers that had been said before us for generations, generations whose hard won loyalties were so authentically embodied in the man and so vibrantly expressed in his work,” he said. Seventy-four-year-old Seamus Heaney died in hospital on Friday following a short illness. Hundreds of people attended his funeral Mass. Co-celebrants at the Mass were Dublin auxiliary, Bishop Eamonn Walsh, the Church of Ireland Archbishop of Dublin, RT Rev Dr Michael Jackson, and Dom Mark Patrick Hederman from Glenstal Abbey. President Michael D Higgins, Taoiseach Enda Kenny, Tanaiste Eamon Gilmore and Minister for Social Protection, Joan Burton and members of other political parties as well as representatives of the arts world. These included Michael Longley, Frank McGuinness and Tom Murphy, poet Garech De Brun and actor Barry McGovern, author Edna O’Brien, painter Robert Ballagh, and many more. At the removal service on Sunday, Archbishop Diarmuid Martin placed a copy of the Bible on top of the coffin, saying it was fitting for Seamus Heaney to have these words with him now as “his life was built around words”. Fr Doran spoke of the legend of how the blackbird built its nest in St Kevin’s hand and then St Kevin had to keep his arm outstretched until the eggs were hatched. He said the poem made universal points about suffering, enduring and nurturing. Books of condolence have been opened at the Mansion House in Dublin, City Hall in Belfast and the Guildhall in Derry.